(NB Austen Ivereigh’s final ‘Postcard from Rio’ is in fact posted in the UK). 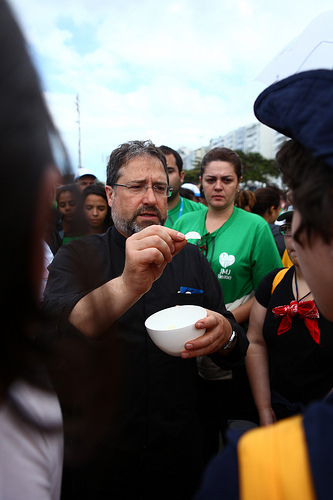 In a press conference in Rio on Tuesday, the Archbishop of Rio, Dom Orani Tempesta, said Copacabana beach had never seen “so many people at peace, happy and committed to building a better world” and he hoped that the spirit of WYD would last. He also gave the numbers — although, of course, it’s not just about numbers. Still, they’re impressive. Attendance at the liturgies rose from 600,000 on Thursday 25 July to 3.7m at the final Mass on Sunday (more than the earlier estimate of 3.2m). 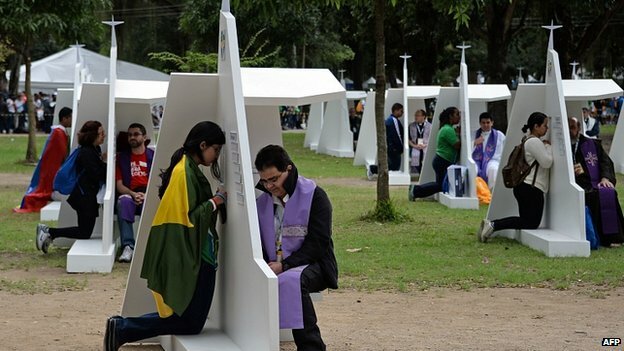 427,000 pilgrims registered, from 175 countries, with most coming from (in order) Brazil, Argentina, USA, Chile, Italy, Venezuela, France, Paraguay, Peru and Mexico. 55% of those registered were women, 45% men. 60% were between 19 and 34 years. There were 60,000 volunteers, 6,500 accredited journalists from 57 countries, 264 catechesis sites, offering more than 700 catechesis sessions in 25 languages. 100 confessionals, 4m consecrated hosts, 644 bishops, 28 cardinals, 7,814 priests and 632 deacons. 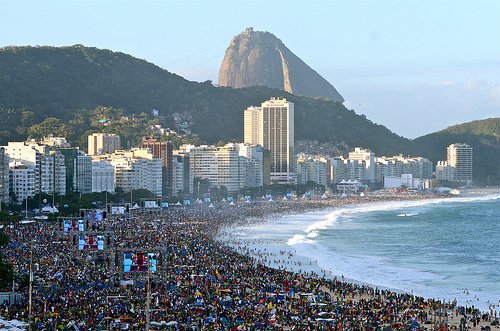 The Ministry of Tourism estimates the economic benefit to Rio as 1.8bn reais, or about 6bn euros. The weekend’s two great liturgies — the Vigil on Saturday night and the farewell Mass on Sunday — were simply breathtaking: at least 2.5m pilgrims at the Vigil, climbing to 3.2m on Sunday, created a sea of piety almost as large as the sea itself. And in spite of all the dire predictions of chaos and breakdown — of which there had been plenty of evidence during the week — the logistics ran smoothly. 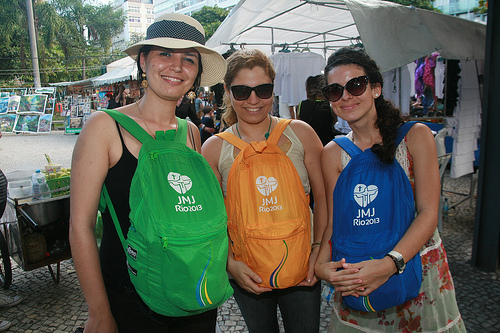 The WYD organisers pulled off the remarkable feat of transferring the entire church stage, along with tents of consecrated hosts (giving Communion to 3m people is no small feat) from Guaratiba, where the weekend’s events were originally due to be held, to Copacabana beach in the south of the city. 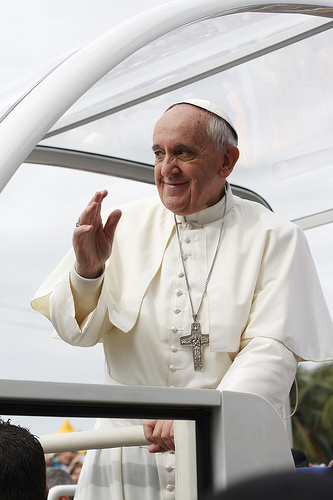 As became even clearer on that final weekend, Pope Francis’s Brazil visit was effectively the launch of the programme of his papacy. That doesn’t mean everything was new; in fact, much of what he said in Rio he has said over the last four months in asides, or addresses, or his daily homilies. But in Rio, the programme was laid out more thoroughly and systematically than at any time since his election. 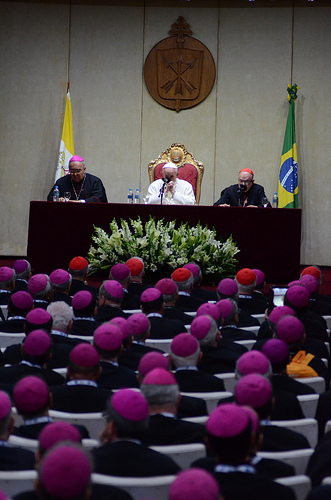 Earlier on Saturday, Pope Francis delivered one of the most important addresses of his pontificate, to the 300-strong members of the Brazilian bishops’ conference, the world’s largest. Reflecting on the Aparecida story, he noted that God always enters human history “clothed in poverty, in littleness”, and always tests the patience of those waiting for Him. The Church had to learn from this. “Without the simplicity of their approach,” he said, referring to the fishermen who found the Virgin, “our mission is doomed to failure”. At times we lose people because they don’t understand what we are saying, because we have forgotten the language of simplicity and import an intellectualism foreign to our people. Without the grammar of simplicity, the Church loses the very conditions which make it possible “to fish” for God in the deep waters of his Mystery. He then considered our times. Despite “teething problems”, the Second Vatican Council, he said, “has led to a Church gradually more mature, open, generous and missionary”. This was not an age of change, but a change of age. It been hard watching so many leave the Church, either to embrace new religious groups, or to try to live without God altogether. Perhaps the Church appeared too weak, perhaps too distant from their needs, perhaps too poor to respond to their concerns, perhaps too cold, perhaps too caught up with itself, perhaps a prisoner of its own rigid formulas, perhaps the world seems to have made the Church a relic of the past, unfit for new questions; perhaps the Church could speak to people in their infancy but not to those come of age. It is a fact that nowadays there are many people like the two disciples of Emmaus; not only those looking for answers in the new religious groups that are sprouting up, but also those who already seem godless, both in theory and in practice. Today, we need a Church capable of walking at people’s side, of doing more than simply listening to them; a Church which accompanies them on their journey; a Church able to make sense of the “night” contained in the flight of so many of our brothers and sisters from Jerusalem; a Church which realizes that the reasons why people leave also contain reasons why they can eventually return. But we need to know how to interpret, with courage, the larger picture. She gives birth, suckles, gives growth, corrects, nourishes and leads by the hand … So we need a Church capable of rediscovering the maternal womb of mercy. Without mercy we have little chance nowadays of becoming part of a world of wounded persons in need of understanding, forgiveness, love. At the Vigil on Copacabana beach, a ‘church’ was symbolically ‘built’ on the proscenium in front of Pope Francis — an allusion to the famous command of God to St Francis to “rebuild my Church”. The training, he said, involved daily prayer, sacraments, and loving others (“learning to listen, to understand, to forgive, to be accepting and to help others, everybody, with no one excluded or ostracized”) in order to build a more just and fraternal society, starting with each person. And he addressed, for the first time explicitly, the protests on the streets of Brazil. 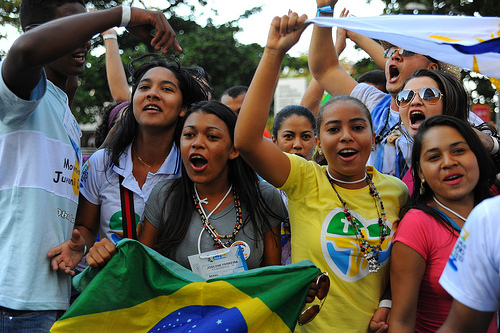 I have been closely following the news reports of the many young people who throughout the world have taken to the streets in order to express their desire for a more just and fraternal society – (and here in Brazil), they have gone out into the streets to express a desire for a more just and fraternal civilization. These are young people who want to be agents of change. I encourage them to continue overcoming apathy and offer a Christian response to social and political concerns present in their countries. But the question remains: Where do we start? What are the criteria for building a more just society? Mother Teresa of Calcutta was once asked what needed to change in the Church. Her answer was: you and I! 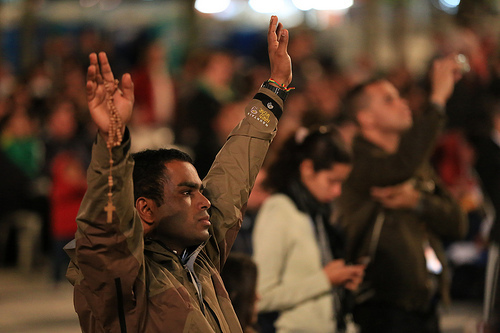 The Vigil showed the Pope at his evangelising best, rousing the sea of pilgrims with challenges and questions, then settling them into prayer. Hundreds of thousands contemplated silently before the Eucharist before settling into their sleeping bags for the night, at one with God under the stars and the incoming waves. 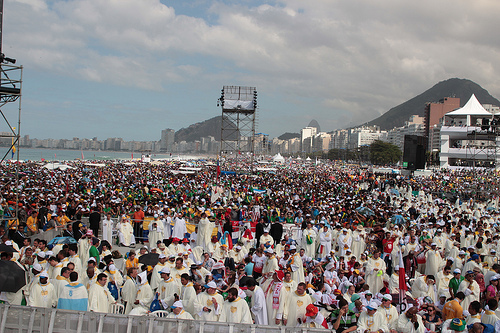 At Mass the next day Pope Francis addressed the largest ever crowd assembled in Rio’s history. The figure of 3.2bn (later revised to 3.7m) comes close to the estimated 4m at WYD in Manila, thought to be the largest ever assembly of people in human history. 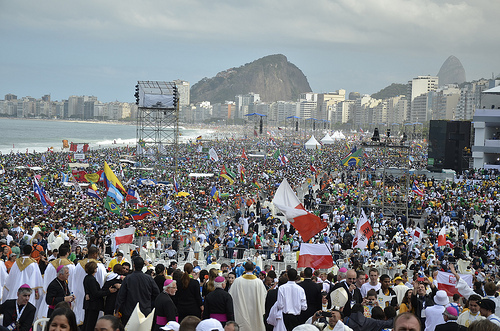 It helps, of course, that Brazil is the world’s largest Catholic country; a clear majority of those attending the Mass were locals. But it was most obviously a sign of the magnetic Francis effect. The Brazilian media have been full of stories of people as result of Francis’ visit taking a second look at the Church after years of being away. It is as if the effect he had in Italy after his election had finally reached the shores of the New World. Go, do not be afraid, and serve. If you follow these three ideas, you will experience that the one who evangelizes is evangelized, the one who transmits the joy of faith receives joy. Dear young friends, as you return to your homes, do not be afraid to be generous with Christ, to bear witness to his Gospel. In the first Reading, when God sends the prophet Jeremiah, he gives him the power to “pluck up and to break down, to destroy and to overthrow, to build and to plant” (1:10). It is the same for you. Bringing the Gospel is bringing God’s power to pluck up and break down evil and violence, to destroy and overthrow the barriers of selfishness, intolerance and hatred, so as to build a new world. 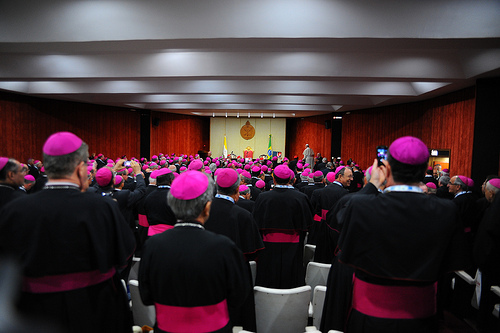 Sunday afternoon, Pope Francis addressed 45 bishops from across Latin America and the Caribbean who belong to the Coordination Committee of CELAM, the umbrella body of Latin-American bishops’ conferences, which has met five times since it was created in 1955 – most recently, of course, at Aparecida in 2007, when the then Cardinal Bergoglio coordinated the drafting of its concluding document. 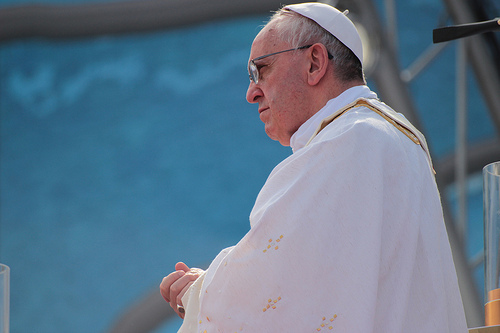 Francis’s address was, by papal standards, brutally honest, highlighting a series of temptations facing the Church (in Latin America, but his words applied to the Church almost everywhere) which were preventing its renewal. He began by asking for an examination of conscience, to assess how well the Church was absorbing the call of Aparecida. Most of these related to the role of lay people. In practice, do we make the lay faithful sharers in the Mission? Do we offer them the word of God and the sacraments with a clear awareness and conviction that the Holy Spirit makes himself manifest in them? Is pastoral discernment a habitual criterion, through the use of Diocesan Councils? Do such Councils and Parish Councils, whether pastoral or financial, provide real opportunities for lay people to participate in pastoral consultation, organization and planning? The good functioning of these Councils is critical. I believe that on this score, we are far behind. As pastors, bishops and priests, are we conscious and convinced of the mission of the lay faithful and do we give them the freedom to continue discerning, in a way befitting their growth as disciples, the mission which the Lord has entrusted to them? Do we support them and accompany them, overcoming the temptation to manipulate them or infantilize them? Are we constantly open to letting ourselves be challenged in our efforts to advance the good of the Church and her mission in the world? Do pastoral agents and the faithful in general feel part of the Church, do they identify with her and bring her closer to the baptized who are distant and alienated? He then went on to spell out what he called “temptations against missionary discipleship”, for it was important, he said, “to know where the evil spirit is afoot”. 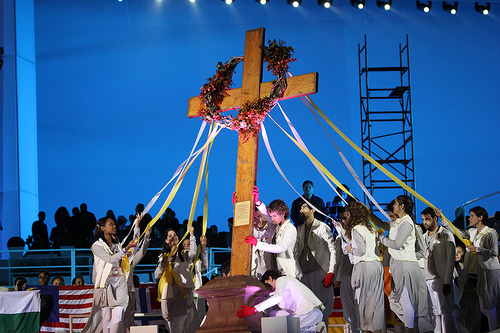 The first was to turn the Gospel message into an ideology, either through a hermeneutic drawn from the social sciences (eg market liberalism or the use of Marxist categories), through “psychologising” (an elitist hermeneutic which focusses on self-awareness), Gnosticism (“enlightened Catholics” who focus on certain disputed questions, or Pelangianism (a form of restorationist Catholicism which seeks to recover a lost past through a “purely disciplinary solution”). The second was functionalism, in which efficiency is the most important criterion, so reducing the Church to an NGO. The third was clericalism, which involved, he said, a “sinful complicity”: “the priest clericalizes the lay person and the lay person kindly asks to be clericalized, because deep down it is easier”; this explained, he said, “the lack of maturity and the lack of freedom in a good part of the Latin-American laity”. A missionary disciple cannot be his own master, his immanence is in tension towards the transcendence of discipleship and towards the transcendence of mission. It does not allow for self- absorption: either it points to Jesus Christ or it points to the people to whom he must be proclaimed. The missionary disciple is a self-transcending subject, a subject projected towards encounter: an encounter with the Master (who anoints us as his disciples) and an encounter with men and women who await the message. That is why I like saying that the position of missionary disciples is not in the centre but at the periphery: they live poised towards the peripheries… including the peripheries of eternity, in the encounter with Jesus Christ. In the preaching of the Gospel, to speak of “existential peripheries” decentralizes things; as a rule, we are afraid to leave the centre. The missionary disciple is someone “off centre”: the centre is Jesus Christ, who calls us and sends us forth. The disciple is sent to the existential peripheries. The Church is an institution, but when she makes herself a “centre”, she becomes merely functional, and slowly but surely turns into a kind of NGO. The Church then claims to have a light of her own, and she stops being that “mysterium lunae” of which the Church Fathers spoke. She becomes increasingly self-referential and loses her need to be missionary. From an “institution” she becomes a “enterprise”. She stops being a bride and ends up being an administrator; from being a servant, she becomes an “inspector”. 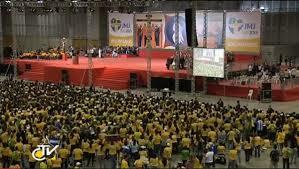 Aparecida wanted a Church which is bride, mother and servant, a facilitator of faith and not an inspector of faith. He went on to criticise pastoral plans that were distant and cold, and homilies that were abstract and detached; these, he said, failed to communicate the nearness and tenderness of God. In Latin America and the Caribbean there are pastoral plans which are “distant”, disciplinary pastoral plans which give priority to principles, forms of conduct, organizational procedures… and clearly lack nearness, tenderness, a warm touch. They do not take into account the “revolution of tenderness” brought by the incarnation of the Word. There are pastoral plans designed with such a dose of distance that they are incapable of sparking an encounter: an encounter with Jesus Christ, an encounter with our brothers and sisters. Such pastoral plans can at best provide a dimension of proselytism, but they can never inspire people to feel part of or belong to the Church. Nearness creates communion and belonging; it makes room for encounter. Nearness takes the form of dialogue and creates a culture of encounter. One touchstone for measuring whether a pastoral plan embodies nearness and a capacity for encounter is the homily. What are our homilies like? Do we imitate the example of our Lord, who spoke “as one with authority”, or are they simply moralizing, detached, abstract? 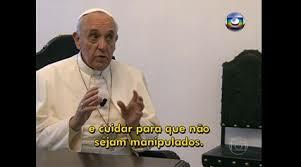 Bishops, he said, must lead (conducir) but not boss people about (mandonear). And he went on to spell out the kind of bishop he wanted to see in the Church. God calls you to make definitive choices, and he has a plan for each of you: to discover that plan and to respond to your vocation is to move toward personal fulfilment. 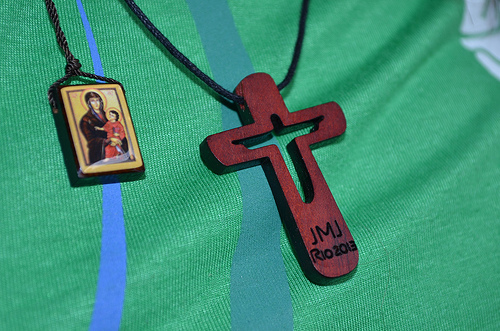 God calls each of us to be holy, to live his life, but he has a particular path for each one of us. Some are called to holiness through family life in the sacrament of Marriage. Today, there are those who say that marriage is out of fashion; in a culture of relativism and the ephemeral, many preach the importance of “enjoying” the moment. They say that it is not worth making a life-long commitment, making a definitive decision, “for ever”, because we do not know what tomorrow will bring. I ask you, instead, to be revolutionaries, to swim against the tide; yes, I am asking you to rebel against this culture that sees everything as temporary and that ultimately believes that you are incapable of responsibility, that you are incapable of true love. I have confidence in you and I pray for you. Have the courage “to swim against the tide”. Have the courage to be happy. 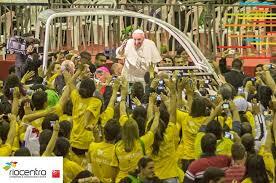 And he returned to theme of “missionary disciples” when referring to the young people at the airport before leaving Brazil Sunday night. 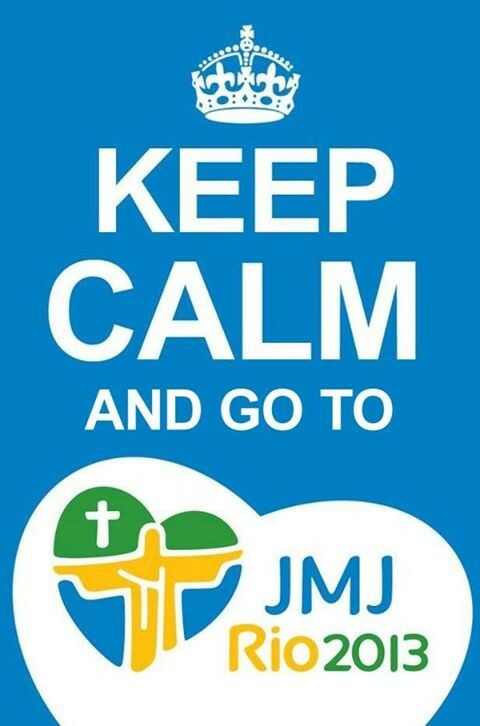 Many of you came here as disciples; I have no doubt that all of you will leave as missionaries. Through your joyful witness and service, help to build a civilization of love. Show, by your life, that it is worth giving your time and talents in order to attain high ideals, it is worth recognizing the dignity of each human person, and it is worth taking risks for Christ and his Gospel. It is he that we have come to seek because he first sought us. It is he who has inflamed our hearts with the desire to take the Good News to the large cities and to the small communities, to the countryside and to all the corners of this vast planet. I will always place my hopes in the young people of Brazil and in the young around the world: through them, Christ is preparing a new springtime all over the earth. I have seen its first fruits and I know that others will joyfully reap the full harvest. 3. 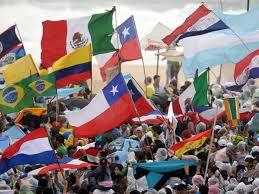 LOSS OF CATHOLICS TO THE EVANGELICALS IN BRAZIL. “For me the nearness of the Church is fundamental. The Church is a mother. You and I know know of no mothers who communicate with their children by letter. A mother is affectionate, she touches, she kisses, she loves. When the Church, busy with a thousand things, neglects that nearness, and communicates only using documents, it’s like a mother communicating with her children only by letter. I don’t know if that happened in Brazil, but in some places in Argentina this happened, and the lack of priests in many places left people were left in need of the Gospel”. He told a story of a missionary in the south of Argentina, who went to a town which had been 20 years without a priest. An educated lady told the missionary that she was angry with the Church for having abandoned them, and went every Sunday to hear the local pastor, for “he has been the one who has nourished our faith all these years”. When the priest, after listening to her, made to leave, she took him to a cupboard where she kept an image of the Virgin, hidden from the pastor. “That woman went to the pastor, she respected him, he spoke of God and she accepted — but the roots of belonging she kept hidden in a cupboard.” This, he said, was the most serious phenomenon: lack of nearness. 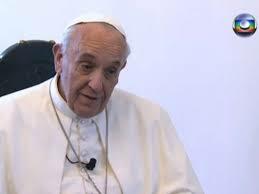 Referring to the scandal over the Vatican Bank official caught laundering millions of euros, Francis said that he had acted badly, and the Church would need to punish him appropriately. He noted that in the cardinals’ meetings prior to the Conclave they had called for a series of “functional” reforms, suggesting a group made up of ‘outsiders’ to study the problems of the Curia; he said he had named that commission — made up of 8 cardinals from all continents — within a month of his election. “Many documents have already arrived which the commission members have obtained and which have been circulating among us. We will have our first formal meeting on 1-3 October. And there we will study some new guidelines.” he said that it was very important for the proposals to be carefully considered and time given to them. “I think there will be need to be two or three more meetings before reforms are announced,” he said. 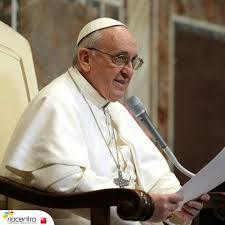 He said the Church needed constantly to reform to bring its structures in line with the needs of the time. 5. MESSAGE TO YOUNG PEOPLE PROTESTING ON BRAZIL’S STREETS. After making clear that he did not know the motives of the protesters, he said: “I don’t like a young man who doesn’t protest … A young man is essentially a nonconformist, and that is a very beautiful thing. You need to listen to young people, giving them outlets to express themselves and ensure they don’t get manipulated.” Young people should always be listened to, he said. 6. MONEY. “This world has fallen into the ferocious idolatry of money, and this has given rise to a global politics impregnated by the protagonism of money — the one who rules now is money.” He described this as an “self-sufficient economicism without ethics” in which all the focus was on the “centre” of society, while its edges (las puntas) were neglected and dismissed. As examples, he said, just look at the way the elderly, seen as unproductive, were discarded and the alarming levels of youth unemployment in Europe. 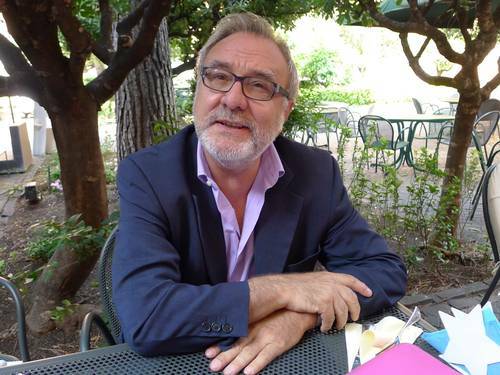 He said the “drama of this inhuman humanism” was what he has called “the globalisation of indifference”: when the Stock Exchange is down three points, that was news, but children going to bed hungry was not news. 7. CULTURE OF ENCOUNTER. Asked about his message to non-Catholics, he said what was needed above all was a “culture of encounter” in which different people met on the ground of common action for others. The needs were today so great, he said, that people of different faiths and no faith had no excuse to be “fighting among ourselves, with our backs to everybody else”. What was essential, he said, was to “work for others” and to “meet there”. He said it didn’t matter whether it was a Jew or an atheist or a Catholic helping to relieve suffering or helping another — the important thing was the action. He also spoke of the importance of “talking”, of people of different confessions explaining the reasons for their beliefs, and helping others to understand them. “But above all, today,” he said, “what was called for was closeness, the coming out of ourselves to solve the tremendous problems of the world which exist”. The different faiths, he said, cannot sleep soundly as long as there were children going to bed hungry or lacking basic medicine. He said the work of religion was not just about charity; “but at least in our Catholic faith and in other Christian traditions”, he said, “we will be judged by our acts of mercy”. 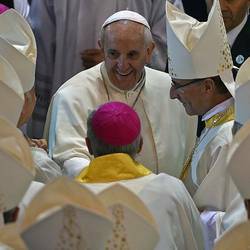 In an interview with Sunday’s O Globo newspaper, the seasoned Vatican observer and commentator Marco Politi says that Pope Francis is putting forward “another model of Church” which is putting an end to the era of the monarchic-imperialist model of the Counter-Reformation in favour of what he calls “a communitarian Church led collegially by the Pope together with the bishops”. 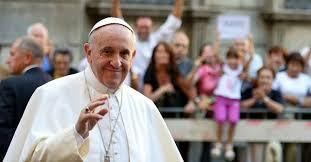 He said the Pope has “started a revolution” which is encountering strong resistance in the Vatican. Pope Francis, says Politi, is different from both Benedict XVI and John Paul II who he describes as “human like him, but an emperor”. John Paul II, he said, “did not change the structure of the absolute monarchy of the papacy”, while the then Cardinal Ratzinger in 2004 said that the Church could no longer be governed as a monarchy but while he saw the problem, as Pope Benedict he did not have the strength to change it. I’ll try and pull all these threads together into a Francis-style three-point summary. 1. Aparecida. 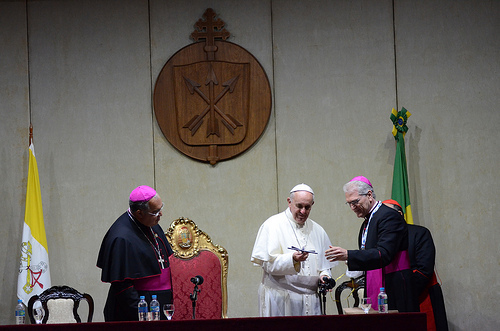 Brazil launched the programme for the papacy (and the Church), which is strongly shaped by the Aparecida vision of missionary discipleship, option for the poor, and respect for popular devotions (because God speaks through the poor). 2. Church of the Poor. 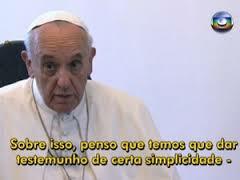 In Brazil Francis modelled a pastoral style in which the signature notes are simplicity, humility, and nearness — meaning physical presence and warmth – -as well as a “culture of encounter” which seeks to include and reconcile groups (eg the elderly and the young) who have pushed to the margins by a society dominated by the idolatry of money. 3. Reform for mission. Francis showed his determination to reform the Church by re-focussing its energies and efforts on evangelisation and mission, seeking to overcome any signs of introspection and self-centredness (corruption, clericalism, abstraction, bureaucracy, etc.). In this effort, the committed youth of the Church are key — and he would rather a Church that creates “havoc” than one that plays safe.